If you want to assist with this project or to join the Rhodesian Services Association please contact us. We are a New Zealand registered charitable organization. We seek to preserve the military records and history of Rhodesia. We have established The Lion & Tusk – Museum of the Rhodesian Services Association at Unit 10, 14 Portside Drive, Mount Maunganui, New Zealand. In these pages we intend to avail the public of valuable records and resources for research and general interest. We have a lot of work ahead of us – please lend your support to our Association in any way that you can – donations, financial membership, purchases through our CQ Store, remembering us in your will – it all helps. DONATIONS New Zealand residents can email thecqstore@rhodesianservices.org to get our bank details or, if you live outside New Zealand you can make a donation using the button below via PayPal. If you are not registered with PayPal, on pressing the button below you will be given instruction how to make a credit card via PayPal. Thank you – every bit helps. Multiple records of individuals are to be expected. For instance, the BSAP issued a new service number when a policeman or woman signed on for a new contract period. Some records only have first name initials thus making it difficult to identify and eliminate multiple records with certainty. Others may be recorded on different rolls where we have applicable information, eg: a person may appear on the Rhodesian Forces Nominal Roll and the Rhodesian Honours & Awards. Spelling mistakes and misspelling of names provide challenges for any project like this and accordingly we have noted alternate spelling in the records. All the records that we have accessed are old; some are over 100 years old; many are handwritten – we have made every effort to be accurate and we have carefully cross referenced and corrected spelling and date details where possible however mistakes are inevitable and we welcome correction. Please use the contact form. Rhodesian Roll of Honour – casualty details of Rhodesian soldiers in service at the time of their death as well as allies serving in Rhodesia between 1890 and April 1980. Free access to most details, a fee is applicable if a printable report is required. Rhodesian Forces Nominal Rolls – details of soldiers who served in Rhodesian units and of Rhodesians serving overseas from 1890 – 1980. Fee applicable for printable record. Rhodesian Honours & Awards – details of medals and awards made to Rhodesians covering mainly police and military service but also including civil and Fire Brigade from 1970 – 1980. Some records have images of sample medals or if possible photos of the recipient’s medal group. Fee applicable for printable record. Associated Allied Forces & Commonwealth Monitoring Force – details forces allied to Rhodesia i.e. : Imperial troops serving in Rhodesia during the native rebellions, during the Anglo Boer War (Rhodesian Field Force), WWII (Rhodesian Air Training Group), South African forces in Rhodesia during the Bush War and the Commonwealth Monitoring Force of 1979 deployed to Rhodesia during the ceasefire. 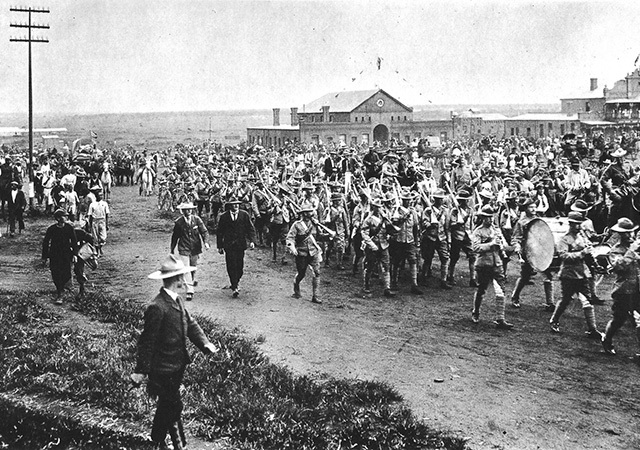 on their way to the Anglo Boer War. Countless hours have been put into this project by way of research then data entry and final editing. At the time of opening this project to the public in August 2017 we will only have approximately a third of our envisaged material loaded. We recommend that you revisit this site at regular intervals to see what progress has been made. The search page of every contains a link where you can view a list of the component rolls.